For the most part, the adjustments seem relatively minor but offer improved flexibility and streamline the Google property with the new Google+ look (all good stuff, with the exception of more prevalent ads –we’ll get to that). There’s been ample speculation that the update will coincide or preface Gmail-Google+ integration, a feature users of the fledging social network have been calling for since day one. If you don’t want to watch the 1:30 video for yourself, here’s a quick recap of everything Google revealed. 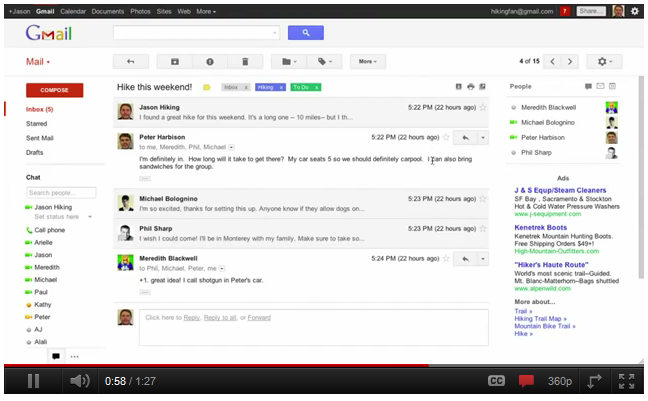 New Gmail will auto-adapt to fit your browser window as you drag it into your preferred size. Take this a step further by customization how your inbox is displayed with new options under the gear icon. You can keep things nice and tight, allow more space per email, or choose the in-between. We’re guessing netbook users out there will appreciate this update. 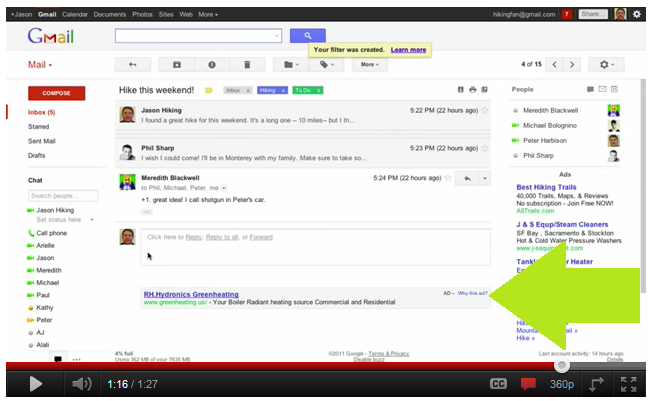 You can also determine what gets the most real estate on the left-hand sidebar, chat or inbox labels. 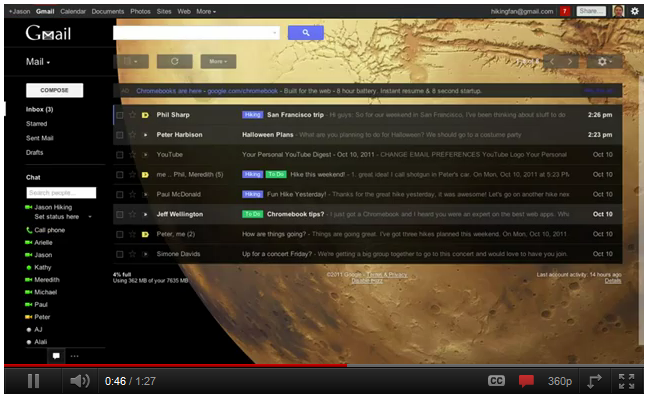 If you don’t like the stark new Gmail, Google is also including the option to decorate the space. New high-res images will be available to personalize your email client’s backdrop. This update is oddly reminiscent of Facebook Messages, where your every communication is linked to show an endless conversation. 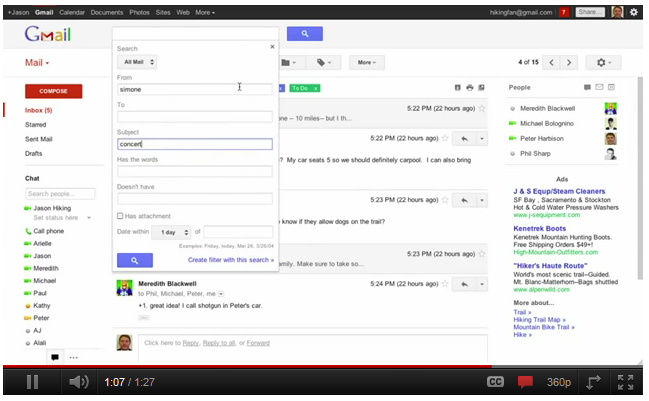 Gmail will now format your emails so that they read more like posts on a topic. Google says this will simultaneously improve readability and make it “feel more like a real conversation.” And in yet another Facebook-like move, profile pictures will pop up in individual emails as well. Searching your Gmail account will now drop down a number of features to help you find what you’re looking for as quickly as possible. You can specify who something is from or to, its subject, what words are or aren’t in it, whether it has an attachment, by date – or all of the above. 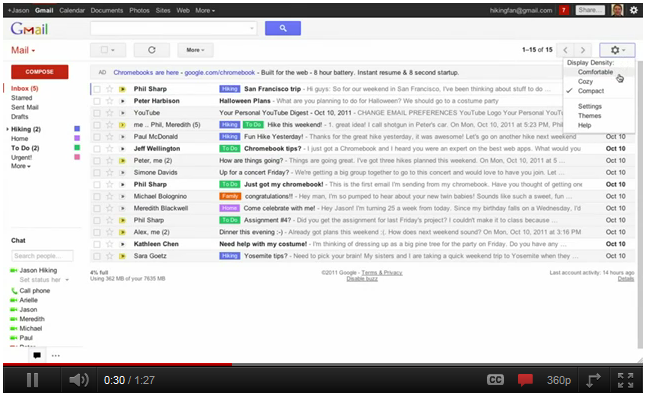 Of course, Google didn’t point out the ad that managed to sneak its way into the video. It looks like Google will be introducing Smart Ads, which collect data over time to offer predictive marketing instead of just scanning the email you have open for keywords. It appears they will sit in below the reply box. Google’s had something of a contentious relationship when it comes to ads in Gmail, and there could easily be user backlash to the latest change.